If you read my blog regularly you probably have noticed on the right side of the page there is a box that shows "Followers" usually right next to my daily entry. If you are a "Follower" you will get notified automatically every time I put up a new entry. I know there are more than 86 of you who follow my blog on a daily basis, if not semi-weekly, or a weekly basis. We would love to see that number more accurately reflect how many people do read the blog on a regular basis. So please, if you are so inclined, become a follower by clicking on the "button" just above the "Follower" box entitled "Join this site". Secondly, we do earn income from Google every time people click on one of the ads placed on our site by Google. Please, only click on an ad if you are interested in the subject matter. The income we earn now from Google is rather modest, but being on a fixed income, every little bit helps. We have no control over the type of ads Google places on our site, but for the most part the ads reflect the general content of our blog. So, if an ad interests you, please "click" on it knowing you are contributing to our nomadic wanderings if only in a small way. Thirdly, I list a number of blogs I follow on a regular basis. If any of them look interesting to you check them out. That is how I got to know a number of these nomadic people, and eventually was able to meet up with them. We feel very blessed to be able to be on this endless nomadic journey, and really enjoy sharing our experiences with all of you. Maybe in some small way we have inspired you to take the leap and get on the road full time, or to begin planning to do so. We are not looking for converts, but if you are so inclined, we are always open to meeting those who follow our travels, and have done so on many occasions. If you see we are going to be in, or near an area where you live send us a message and we will get right back to you! Hope to see ya'll out there on the road some day! We, and that is not the "royal we", arose from our slumber around 7 am......usually TLE doesn't get up until closer to 8......there was no wind at all. We were talking excitedly about our afternoon of zip lining coming up at 1 pm. Within an hour, or so the wind came up, so we checked the weather forecast which predicted the winds would get up to 30 mph and stay there most of the afternoon. Hmmmm......I don't know about you, but the thought of being a hundred feet in the air being buffeted about by 30+ mph winds does not appeal to me, and especially not TLE, so she called the park and re-scheduled our "flights" for 1 pm Monday. In the end that probably was for the best as we would have been there zip lining until near 4 pm, and we needed to move the coach to Sedona Pines after we got done, and that would have been a little tight beating sundown, so we decided to hang out until Noon, then move the coach into Cottonwood and park at the Walmart while I got a haircut in their salon, and TLE did some shopping, then move on over to Sedona by 2.....the total driving distance from our boondock spot to Sedona Pines is only 22 miles, so not exactly a grueling day distance wise, but we knew we would have to "drop" the trailer in the parking lot to get into our spot in the RV section, and that might take a little time as it is a small parking lot. Since we had time to kill I got on my mountain bike for another descent down to the valley.....this time my disc brakes were functioning properly, so I went a little faster knowing I had the braking power to slow down if need be. I was going to do two descents and two climbs, but by the time I made it back to the top of the 1 mile climb the wind was getting pretty hairy, so I decided one run without incident was good enough. We spent the rest of the morning stowing away our gear, but not the car.....no point in loading and unloading it for a 22 mile jaunt. Putting the solar panels back down from their tilted position was an adventure in the high winds, but was accomplished without any misadventures. We arrived at the Cottonwood Walmart about 12:20, and headed in for my haircut, and TLE's shopping. I am actually pretty pleased with my $15.50 haircut. TLE finished her shopping just a few minutes before my stylist was done with my cut. We arrived at Sedona Pines just around 2 pm, and dropped the trailer in the parking lot.....fortunately there was just one spot left that would work for us, and that is the way it always seems to go for us. 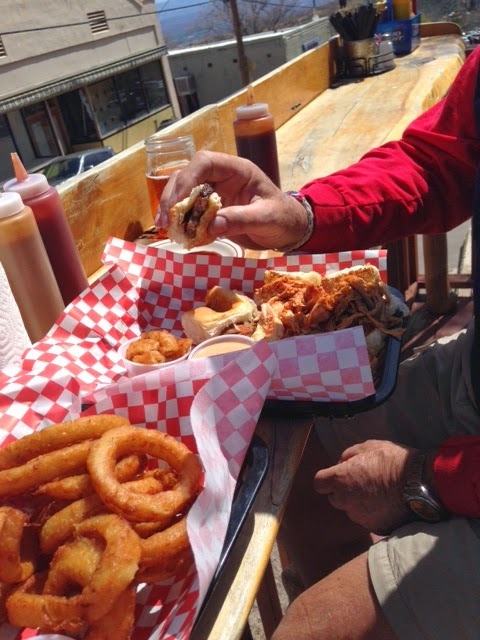 Once we were in our site, were hooked up, and had the satellite dish dialed in, all within within 30 minutes, it was going on 3 pm, and we were both getting hungry, so we opened up our "Yelp" apps and began looking for a suitable place to have a couple of brews, and an early dinner. Ultimately we both settled in on Oak Creek Brewery......Oak Creek Brewery does not serve food, however, just outside their entrance is Simon's Columbia Style Hot Dogs, where you can buy some really gourmet hot dogs and take them into the brewery to eat while you sample brews. Oak Creek Brewery has indoor and outdoor options, but the wind was still too blustery, plus the Kentucky vs. Michigan NCAA game was on, so we opted (mostly me) to sit inside. 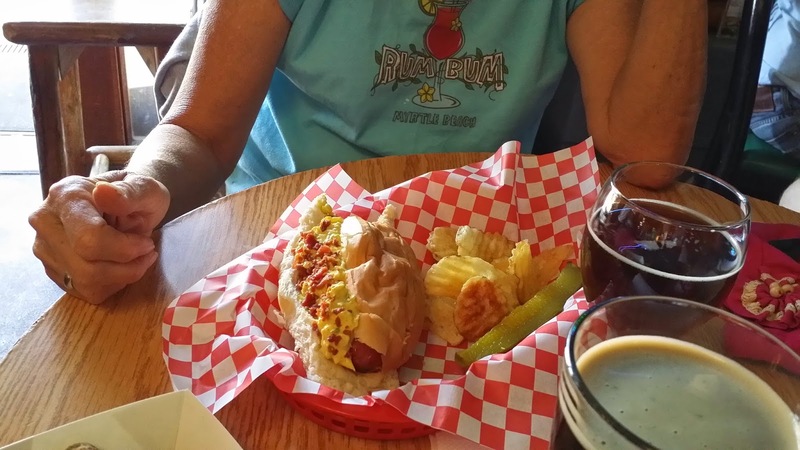 While we waited for our hot dog orders we ordered our brews.....TLE chose an 11% ABV Knicker Kicker Wee Heavy Scotch Ale, and I the Prosperity Porter (6.5% ABV). 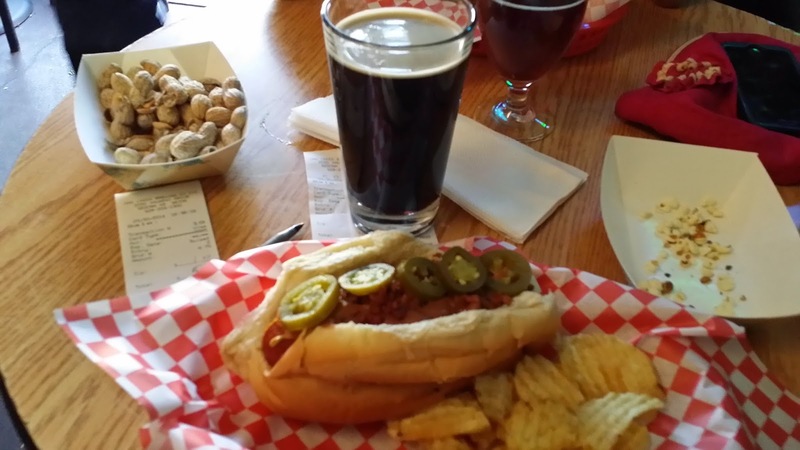 Within 10 minutes our hot dog orders arrived......for me the Sonoran Cousin beef dog with jalepenos and refried beans......amazing! And for TLE the "Wunderhund" beef dog.......again, amazing! We sat there cherishing every bite of these amazing "dogs", sipping our brews, and watching the end of a very close basketball game......Kentucky ended up "sinking" a 30 foot 3 point shot with 2.1 seconds remaining to win the previously tied game by 3 points........Yelp gives Oak Creek Brewing 4 stars on 131 reviews, and Simon's 4.5 on over 200 reviews......we agree on the Oak Creek rating, but would give Simon's a solid 5....some of the best hot dogs we have ever partaken of......bar none. We spent the evening watching "The Amazing Race", "Resurrection" and "The Mentalist", and then hit the sack around 11:30......another day lived well. By the by......I was asked yesterday via personal message how my weight loss was going, and I am proud to report that I have settled in around 190, and seem to be able to stay there without much effort. I would like to lose 5 more pounds, but for now I am pleased to be maintaining my 21 pound weight loss eating smaller portions, not drinking as much beer, and sprinkling in a little "vigorous" exercise here and there. The road that passes by our boondock camp continues on downhill to the Verde River area for a little over 1 mile. I haven't ridden my mountain bike since January 1st, so this seemed the perfect opportunity to do a little downhill and a little climbing. Walking around town is one thing, but I need some real exercise, so around 9:30 am I headed down the road on my Intense 5.5......the road is hard pack with a little sand here and there, but the ride to the bottom was uneventful.....just enjoyed the wind in my face and the scenery. Then it was time to climb back to the top. The road never seems as steep going down, but it seemed very steep going up....maybe 9-10%.....but it's all good....I needed to up my heart and respiration rates, and that is exactly what I did. On the way down it seemed my front hydraulic disc brake was not functioning properly, and when I got back to the top I checked it out......well, it was hardly working at all. I had planned to descend at least one more time into the valley, but decided it would be best to have two functioning brakes on that mile descent. After working on the brake for 30 minutes I could not get it to work, so decided since we were going into Sedona anyway I would drop it off at a bike shop to get it fixed. After a quick shower TLE and I mounted the Yakima bike carrier on the VW, then the bike and began our drive into Sedona. TLE snapped a few pictures as we approached Sedona from the south. I fear these pictures do not do justice to what we saw, and how captivating it was. 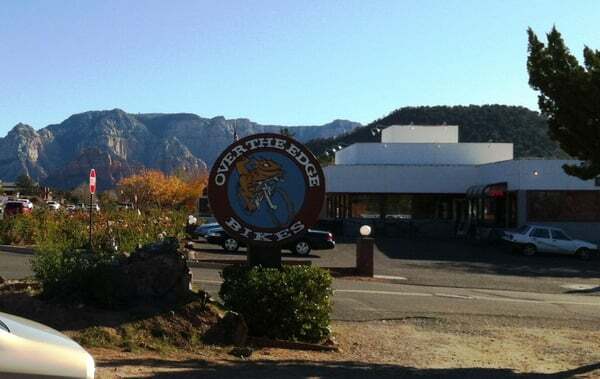 In between picture taking TLE looked up a bike shop called "Over the Edge Sedona", and within minutes I was rolling my bike through the door. The bike mechanic said he could have the bike done between 3 and 4, and it was closing in on 11:30 by that time, so we had plenty of time to explore. Our next stop was the Visitors Information Center where we met Taylor who supplied a whole lot of serendipity for us. Our boondock site is just a few miles from a place called "Out of Africa" which is, essentially, a zip line park built around a wild animal attraction. We have always wanted to ride a zip line, but they are always sooo expensive. They did have one package that included one ride on a 1,000 foot long zip line for $39/person, so we had decided to go Sunday and do that. Here is where the serendipity kicks in.....Taylor (a 20 something young lady) offered us the entire package.....3 hours of zip lining......for $25 per person......wait, what? The full "Predator" zip line tour retail price per person is $90. 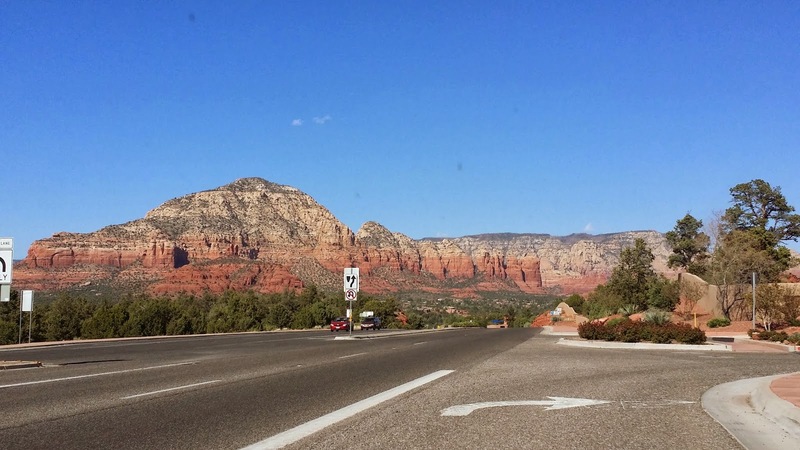 In addition to that she offered us two days and two nights for $25 at a place called Sedona Pines, a kind of timeshare place, where they have mostly 1 and 2 bedroom apartments you can buy in to, but also a dozen, or so RV spots. We had no interest in owning a timeshare again, but for $25 for two nights (regular rate is $75/night) we figured we could sit through a timeshare presentation. All told for $75 we got $330 in value for 90 minutes of our time. Just a side note, if you are on a fixed income, and have limited disposable income, always check into the local visitor's center.....we have gotten these kinds of deals numerous times over the years. Our appointment at Sedona Pines was for 2 pm, and it was 12:15, so we decided to drive to the top of the "switchbacks" on 89A about 16 miles north of Sedona.....many of our friends who have been here before told us we had to drive up there. Of course the views along the way were spectactular. We arrived at the top of the switchbacks around 12:45 and decided to eat a sack lunch TLE had made while enjoying the view....again I just don't think our pictures do what we saw justice. After finishing our lunch we began our walk back to our car.......my phone began ringing....I hardly ever get phone calls.....I didn't recognize the area code, but answered anyway. As it turns out the call was from from Greg Ryder of Cape Blanco Lighthouse fame.....we had applied for a volunteer position there a month, or so ago for September, or October. At the time Greg had all the positions filled, but put us on the waiting list.....as it turns out someone had just cancelled and he was calling to tell us we are in! Additionally, he offered us a two month gig! Our friends Chris and Cherie will also be there for the same two month period, so the serendipity just keeps on rolling in! 2 minutes later I got a call from the bike shop advising my front brake was toast, and they could not fix it either.....well, I guess that makes me feel a little better about my bike wrenching skills. Fortunately I had a spare front brake in the trailer, so I just had him bleed the back brake and replace the pads, which were quite worn as it turns out. About 12:45 we began our descent back to Sedona and our 2 pm timeshare presentation appointment making it to Sedona Pines just a few minute before our appointment.....traffic in downtown Sedona at 1:30 in the afternoon is a real grind! We enjoyed the timeshare presentation provided by our host, Josie, but we have been through many of these over the years, and remained strong.....no money was transferred this day! 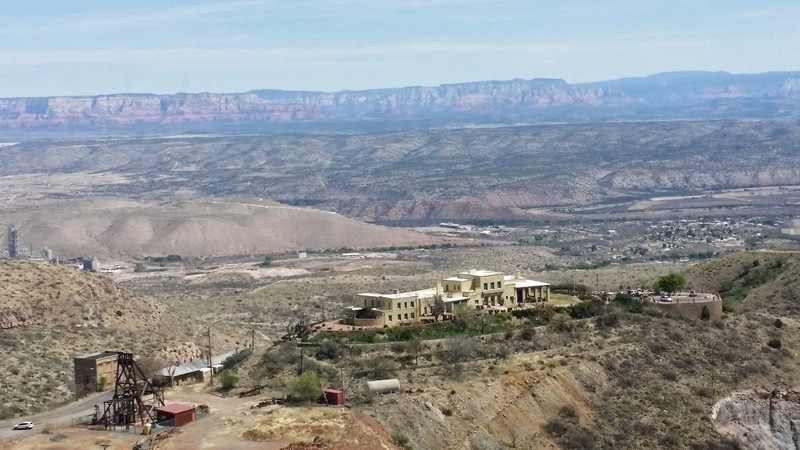 This is a very nice resort just 2 miles outside of Sedona proper, and the pricing is pretty reasonable if a timeshare is what you want. We said our goodbyes, picked up our gift vouchers and headed back to our boondock "home", but not before driving back into Sedona to pick up my mountain bike. 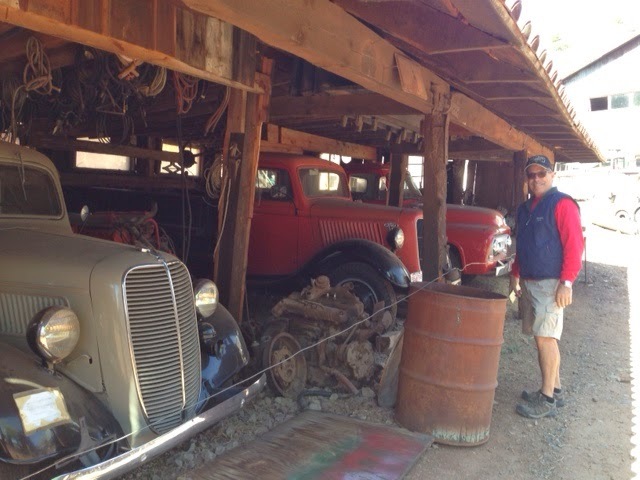 We'll be back to Sedona Pines Sunday afternoon for our two day stint, and more exploring of the Sedona area. Saturday did not turn out anything like we expected, but we just went with the flow and reaped the benefits. We arrived back "home" just after 3:30. I watched a March Madness game between Arizona and Wisconsin......Wisconsin won an overtime game by 2 points....it was a great contest with neither team holding a big lead the entire game.....my kind of game! We awoke Friday to clear, windless skies, and 39 degree temperatures.....that's the coldest temp we have been in for a few months. Overnight, including TV watching Thursday night, our batteries had declined to just 92% of capacity.....not too bad. After watching TV on our old Panasonic LCD we would end the evening at 92%, and by the next morning we would be down to 86%......the new Phillips LED TV uses a lot less energy. That 6% gain in efficiency makes a big difference in how much we will need to use our generator in the future. Usually when we dry camp I would just turn on the big generator (Kohler 7.5 Kilowatt) to make coffee, and run the electric heaters to warm things up. I decided this time to turn on the inverter and use the batteries to make the coffee and run the gas heaters just to see how much power that would take......after warming the coach up, and making the coffee we were down to 88%.....not too bad. At that point I turned on the big generator and in about 1/2 an hour had the batteries back up to 90%, then shut it down at 8 am to let the solar panels take over......by the time we had returned from our day's adventures at 2:30 the batteries were back up to 96%! Ultimately by the time the sun began to dip lower in the horizon we had gotten back to 98%.....wonderful! 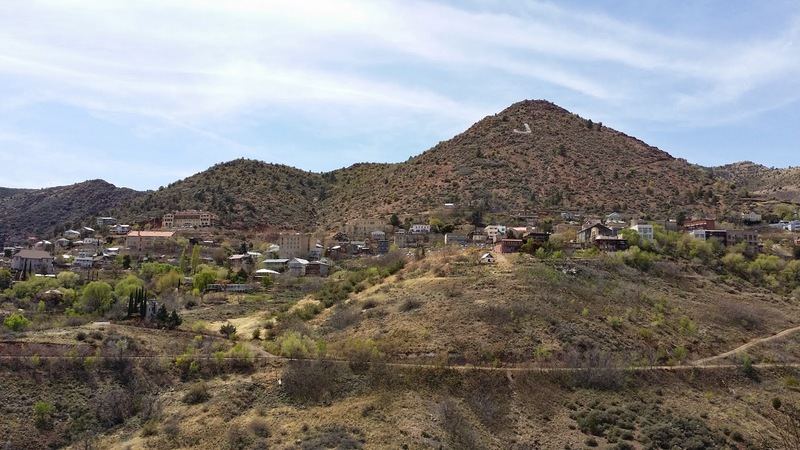 Our first destination of the day was Jerome, AZ (click the link for a more exhaustive history of Jerome), which sits at just over 5,000 feet, and was the site of two large copper, silver and, gold, zinc and lead mining operations that began back in 1876. All told the mines, over 77 years, produced 33 tons of these precious metals valued at over $1 billion dollars. These deposits are considered some of the richest ever found on earth in one location. 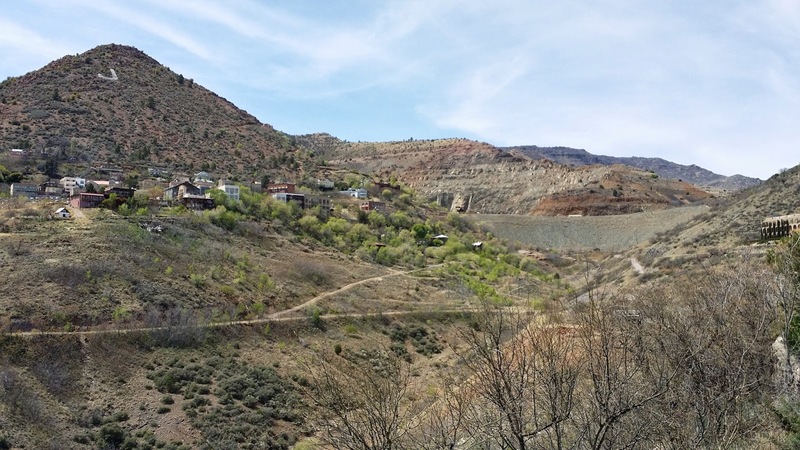 By 1953 the mining operations had ceased, and Jerome became a ghost town. 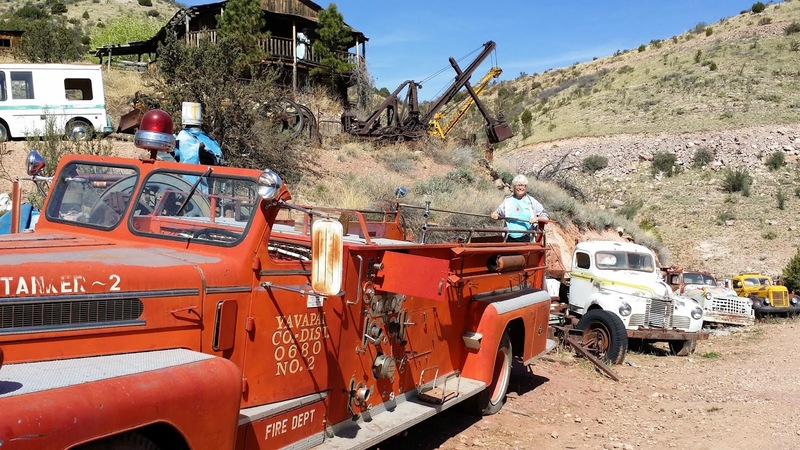 In 1962 the heirs of James Douglas, Jr., the owner of the "Little Daisy Mine", donated his mansion to the National Parks Service, and it became a National Historical Site......since then the town has become the tourist attraction it is today. 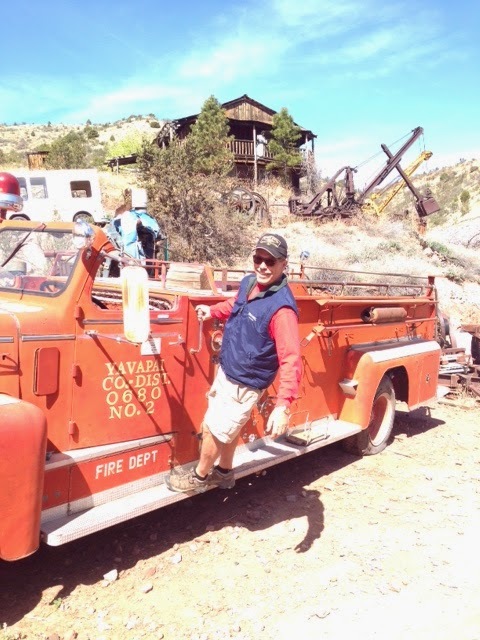 Our first stop in Jerome was the "Gold King Mine and Ghost Town" owned and operated by Don Robertson, whom we met in person. He looks like he stepped out of an 1880's Jerome Mining Camp. 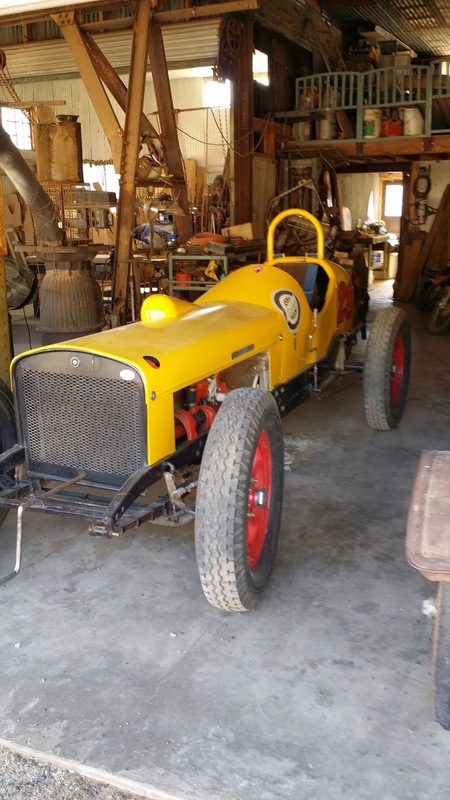 He has a large collection of old Studebaker cars, and trucks, and owns a replica 1928 Studebaker Indy Car (see below) that he built from scratch. Of all the things we saw in Jerome our visit here stands out. Admission for folks of our vintage is $5 per person, and it is worth the money. 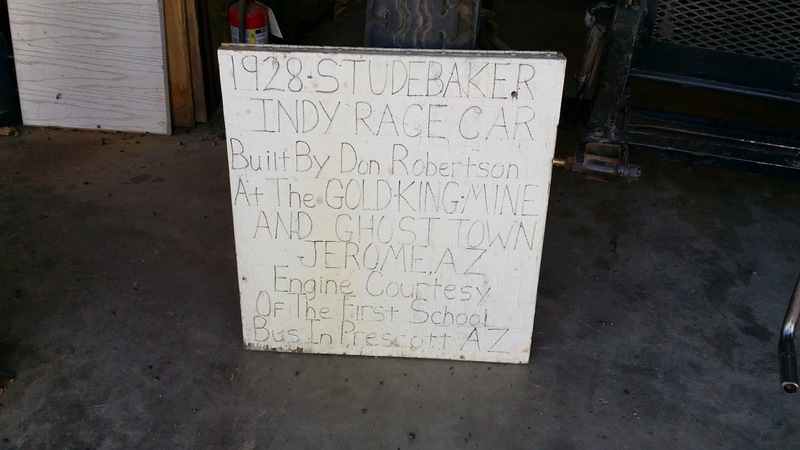 1928 Studebaker Indy Car at "Gold King Mine & Ghost Town"
Next we drove back down into town, found a parking spot and then began to walk around. 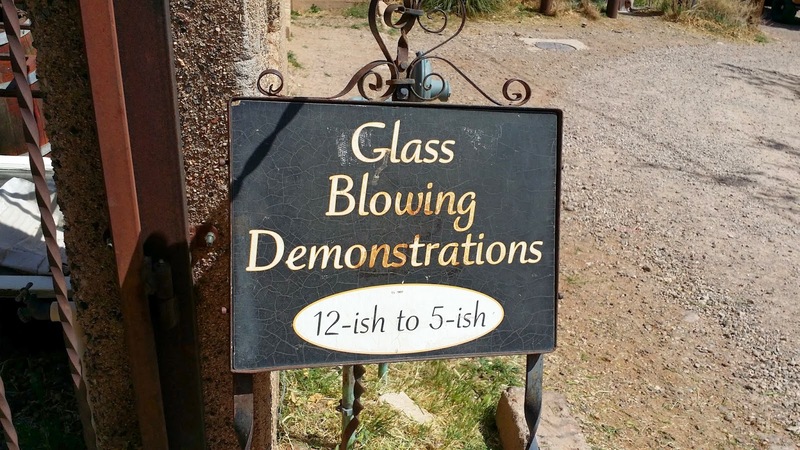 Several people had told us to go and see a glass blowing demonstration so we did. 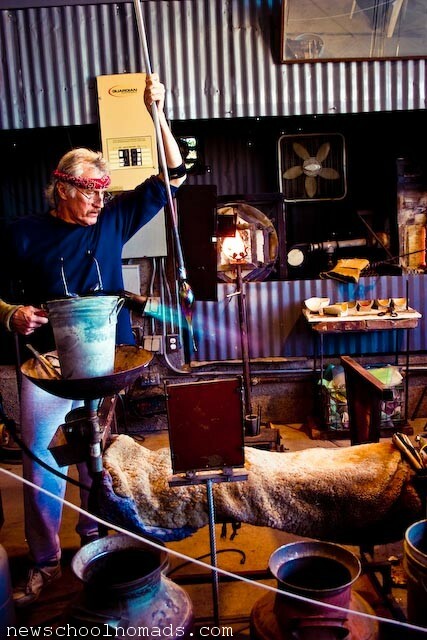 No pictures, or videos are allowed inside the glass blowing studio, so I obtained a photo from the Raku Gallery site of Tracy Weisel giving a demonstration. There is no charge to watch, and Tracy is a fascinating guy. Before and after the glass blowing demonstration I had been looking for a suitable place to have lunch. 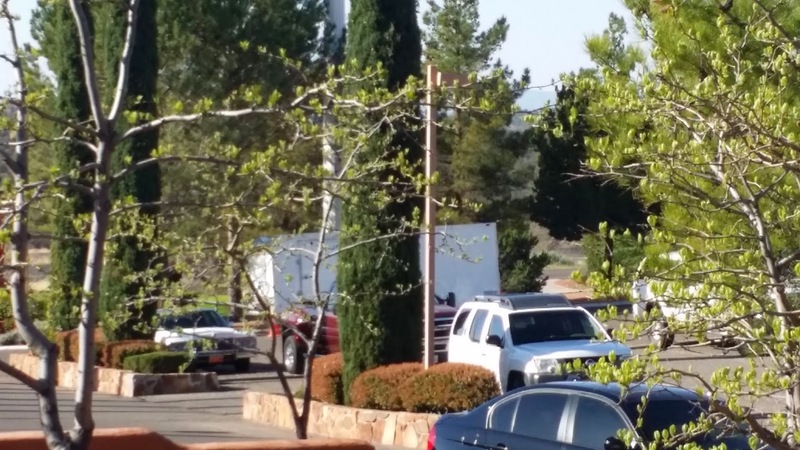 Of course, on such a clear day I wanted to eat outside.....within minutes of leaving the demonstration I spied the perfect place....."Bobby D's BBQ"....they had a large outside deck with a great view of the Verde Valley. 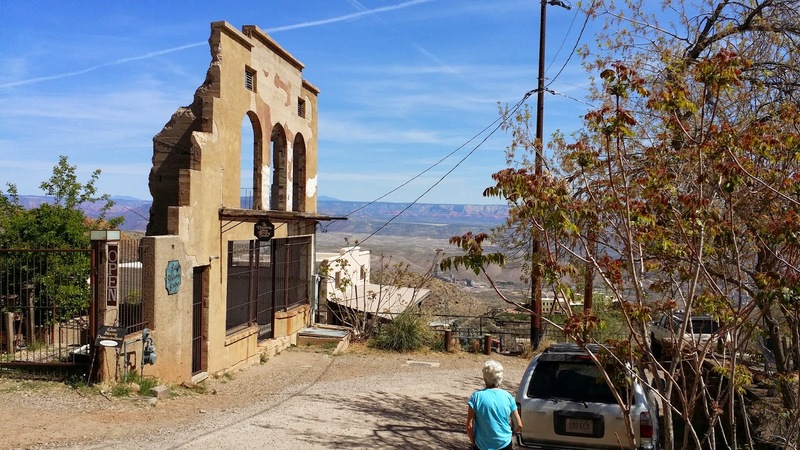 The restaurant is located in what used to be The English Kitchen, and they have retained the name on the building as it is a part of the history of Jerome.....at one time it had the distinction of being the longest continuously operated restaurant in all of Arizona. We sat enjoying the view, and the wonderful weather for close to an hour before paying our tab, and meandering back to the VW for the drive "home". We spent the afternoon resting.....TLE reading....and me....well, around 4 I turned on the TV to watch some more March Madness....there were four games Thursday night, and 4 more Friday....the winners of those 8 games will make of the "Elite 8"....on Sunday the four games will determine the "Final Four". A great first day at our Cottonwood boondocking spot......Saturday we are off to see Sedona. So long, farewell, auf Wiedersehen, goodbye........goes the familiar refrain from the well known movie, Sound of Music, and the song, "So long, farewell". Even though we know we will be back to see our friends, Tom and Darlene, within the year, it was still tough to say "until next time". We spent just over 3 weeks at their home sharing meals, and impromptu driving adventures, and just last summer we spent over a month traveling with them through South Dakota, Wyoming, Montana and Alberta, Canada. To say we consider them very good friends seems an understatement. One of the first things I wanted to know as we ambled down the dirt lane towards pavement was did my repair of the speedometer drive pin work? The answer.....drum roll please.....YES! At first the needle didn't budge and I was thinking my fix hadn't worked, but as we increased speed suddenly it began to move! With a working speedometer I now have a working cruise control. You will recall the drive pin broke back in early June of 2013 in Southern Wisconsin, and neither the speedometer, nor the cruise control have worked since. Hard to believe it has been over 9 months since it broke. Our first destination was the Safeway fuel station I wrote about yesterday. The drive over was uneventful, and I got to test the cruise control to be sure it still worked, and it did. We arrived at the Safeway around 10:15 am, and were on our way by 11 am. We took on 107 gallons of diesel #2 at an average cost of $3.56 per gallon.....that beats the best price we have paid on this journey by 3 cents.....and that was way back in El Paso, TX in February of 2012. 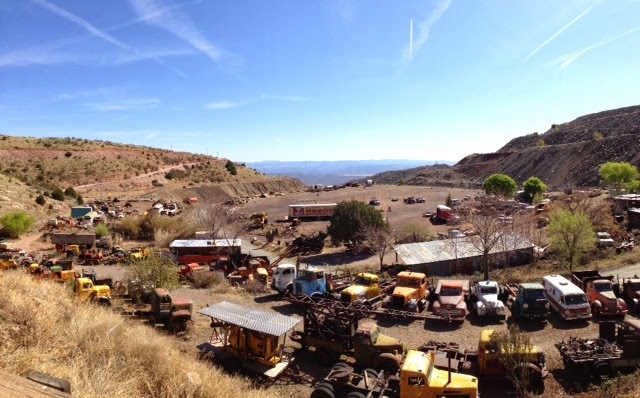 Next up was a dispersed camping area about 20 miles southwest of Sedona, near Cottonwood, AZ. From the Safeway it was a scant 90+ miles to our destination following first the 303 Loop, then I-17 northbound, but what's the hurry, right? About 50 miles later we took advantage of the Sunset View Rest Area to make lunch, and take a break. By 1:30 we had arrived at our boondocking spot for the next 4, or 5 days.....what a view! This location was recommended to us by some Nu-RVer friends, and what a great recommendation it is......we found a place to park initially and then took a walk looking for a spot that would fit our needs. We have two criteria for a boondocking spot.....one, we want to face west so we can tilt our solar panels toward the sun and catch the rays all day long as it moves from east to west, and two we want the passenger side of our coach to be in the shade.....it took us about 15 minutes but we found the right spot not too close to anyone, and with a great view. We wanted to be within a 30 minute drive of Sedona, and Jerome, and this place is perfect. 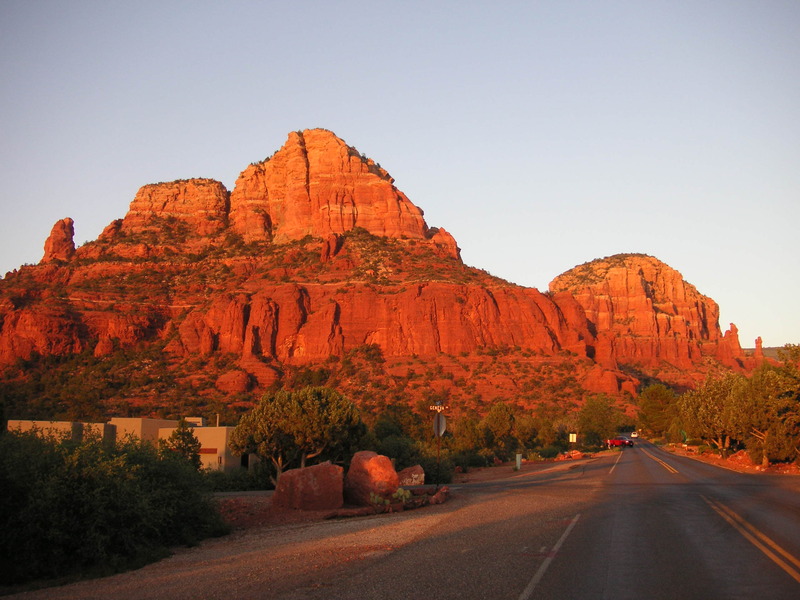 We are 24 minutes from Sedona, and less than 20 from Jerome. Within 40 minutes we had moved into our spot, unloaded the VW, and tilted the solar panels for maximum charging. We were treated to an amazing sunset on our first night here. We were supposed to be "Gone With The Wind" Wednesday, but due to the high wind forecast, and the eventual reality of same, we stayed put one more day. Wednesday was also the day DirecTV was coming to move Tom and Darlene's system to their new home. Of course, Tom and I had to supervise, and ask a lot of questions. I think we did our job well.......the installer was able to use the existing DirecTV HD dish, so no new installation was necessary. It was just a matter of installing the new LNB, and hooking the existing cables up. Within an hour DirecTV was alive and well in Tom's new home. On Thursday when we depart Wittmann we will drive east to the local Safeway Supermarket to fuel up. Why Safeway you ask? Well, every time we spend $100 we get 10 cents off each gallon of fuel we purchase, and we needed to do a major shopping anyway so we drove the VW 15 miles over to Safeway to do our shopping, and to check out the fuel station. While the station itself looks plenty big enough on Google Earth we were unsure which access point would be the best for our 62 feet. It turned out it was a good idea to check it out first, because the most obvious access point would have been almost impossible for us to maneuver through. We found it would be best to drive to the first signal just past the store, turn left, and enter the driveway that takes you behind the store, and eventually to the fuel station. Once we fuel up we'll hop on the 303 Bypass Road and continue eastward to I-17 and north. As it turns out we already had about 65 points ($65 spent in the previous 2 months) and easily passed the 200 point threshold so we will get 20 cents off per gallon on Thursday! One side benefit of staying an extra day was being able to see Tom's son-in-law, Jon, drive his stock race car at Canyon Speedway Park near Peoria. When we visited Jon and Laura (Tom and Darlene's daughter) a few weeks ago Jon had taken us out into the garage to see the car. This is dirt track racing, so the cosmetic appearance of the car is not a big deal.....obviously. There tends to be a little bumping and banging going on during races. This was a guys night out, so Tom and I left Wittmann a little after 5 pm, arriving at the race track just before 6 to find Jon already there. Tom and I were the pit crew this evening, which didn't involve much until the second practice session when Jon got bumped by a slower car he was attempting to pass....the result was a punctured right rear tire, which basically ended the night. We helped Jon get the damaged tire and wheel off, and then straighten out the sheet metal enough so that he could put a replacement tire and wheel on to drive the car on to the trailer. I manged to shoot a little 1 minute video of a few laps (doesn't include the "crash"), which, if you are interested, you can watch below. We were home a little after 9:30, and by that time the winds had died down substantially, just as the forecast predicted.....this morning as I write there is hardly a breath of wind to be found.....just the typical Wittmann gentle breeze. Thursday we are off........this is the real deal.....not a drill....we will be rolling our wheels on Thursday into the mostly unknown! We spent most of the day preparing for our departure Wednesday morning for Sedona. I started out cleaning off bug debri from the front cap of our Newell. I should have done this 3 weeks ago, because the longer that residue remains the harder it is to remove. All that being said I have a new supply of "Firecoat" (waterless car wash product) so I got to work while it was still cool cleaning the front, then moved to the back, which was mostly dusty, then taking advantage of the shade on the passenger side cleaned it, and later in the day when the shade had ensconced the drivers side finished the job. 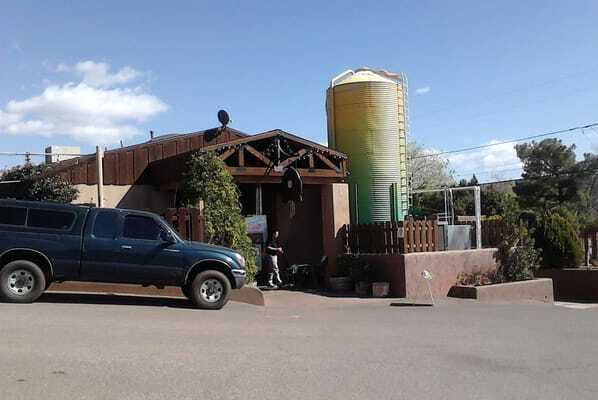 Later in the afternoon I performed the last dump of the black tank wanting to have empty tanks, or nearly so, when we arrive at our boondocking site south of Sedona. Just as I was finishing that task both TLE and I got "Weather Alert" warnings on our cell phones.....the sound put out by our phones made it sound like a four alarm fire was in progress. What was the weather alert (I see a small smile on Mr. Jello's face about now) you ask? HIGH WINDS from the Phoenix area north past Flagstaff.....exactly the area we would be traveling in Wednesday. Driving a high profile rig in high winds can be problematic when they are coming from the side. That is certainly no fun, but even more "un"fun is boondocking in a desert area when there are high winds. Within an hour TLE and I had made the decision to delay our departure by 24 hours giving the winds time to abate, and recede. Originally we had planned to leave Tuesday.....wouldn't that have been fun to be in the desert boondocking site when the winds came? So, while we are disappointed we won't be rolling our wheels toward new adventures Wednesday, we are grateful our decision to leave Wednesday instead of Tuesday spared us the discomfort of being buffeted about in our coach for 24 hours, and the resultant cleanup after the wind had gone. 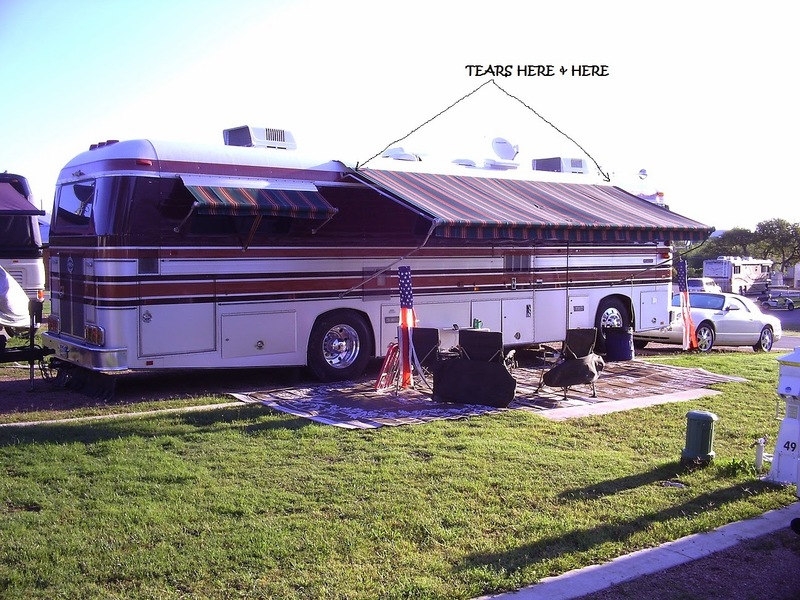 Before the weather alerts came flooding in I spent time preparing the trailer for departure, and then TLE and I stowed all the awnings in preparation for the wind that should arrive mid morning Wednesday from the southwest.....as I write I can hear the wind beginning to pick up. The temperatures reached into the low 90's Tuesday, and we ran our air conditioning for the first time since we arrived.......yup, once again I say it is time to begin moving northward to cooler climes. Darlene decided to make "breakfast for dinner" in the form of waffles, scrambled eggs and maple sausage (provided by us)........and it was a great dinner indeed! We spent the evening watching "NCIS", and "Person of Interest" with Tom and Darlene, and then retired to our coach to watch recorded episodes of "Justified" and "NCIS L.A.". So Wednesday we shall see how bad the winds get.....I hope not too bad. At least we had the choice to stay an extra day......there are no appointments looming out there for us, and no place we have to be, so here in Wittmann we shall abide one more day. There always comes a time in this nomadic life when one must bid adieu to family, and/or friends. I've written more than once about the bittersweet feeling that always seems to come when we must part ways with family and/or friends to continue our nomadic wanderings. After all we have that "list" tucked away in a corner of our minds of people we have yet to meet, places we have not yet been, and things we have never seen before, and while we do not feel rushed to see "it all" immediately, that nomadic instinct is always there whispering to our sub-conscious in soft, seductive tones....."time to move on". Those of us who have chosen a nomadic life over our former "sticks and bricks" existence wrestle continuously with this delicate tension between putting down roots, and continuing to move so roots do not get too deep in any one place, especially when we find a place, or people, or both, that touch us on a deep level. There may come a time when TLE and I decide to put down roots again.....it may be sooner than later, or later than sooner....who knows?......but we do know at some point we may find a place we cannot leave. We don't give that much thought right now, but it is always there just over a horizon we have not yet reached. For now, as we make preparations to once again roll the wheels of our "home" we are hearing the the call of the next horizon......there are people yet to meet, new highways to explore,as and new things to see and experience. Monday (first Saturday) we decided to take a drive with Tom and Darlene up to Wickenburg, AZ about 20 miles north of Wittmann.....Tom needed to pick up a 30 gallon weed sprayer he had ordered at Tractor Supply. In addition, we wanted to explore the downtown area, and get some lunch in the process.....not in any particular order. We left Wittmann around 11:20 am and reached Wickenburg around 11:45.....first stop was El Ranchero Mexican Restaurant upon which Yelp has bestowed a 4.5 star rating.....I'm not sure I would go that far....I'm thinking 3.5 to 4 stars, but it was good. Next we drove over to the "historic downtown" area of Wickenburg to walk around and see what might interest us.....unfortunately, at least on this day, nothing really caught our attention, so we got back in the truck and headed over to Tractor Supply where a lot of things caught our attention.....we spent about 40 minutes browsing up and down the isles while Tom acquired his 30 gallon weed sprayer.....with 1.5 acres you need a big weed sprayer! On our way home a used tractor sales lot caught Tom's eye, so we stopped.....Tom likes tractors, and he likes blue, so it was only natural that this Lenar tractor caught his attention. If the price had been right I think Tom would have bought it on the spot, but it was not to be on this day. We arrived home around 3 pm......I spent the rest of the afternoon beginning to put some of our "stuff" away in preparation for our departure Wednesday morning.....Monday was one of the hottest days we have had since we arrived 3 weeks ago topping out close to 90.....another reason it is time to begin moving northward. We had a delightful dinner out in the ramada watching the sun set yet again on another "Saturday". Sunday saw the continuation of my descent into my annual bout with March Madness. The first game began at 9:15 am and the last ended around 8:30 pm. There were a couple more upsets, but my UCLA Bruins easily bested Stephen F. Austin U. by 17 points to advance to the "Sweet Sixteen" round, which begins this coming Thursday (4th Saturday). There were a number of lopsided games, but about as many came down to the last possession, which is all you can ask for. We attended church services again with Tom and Darlene.....it was their week to speak during the Sacrament service, and we wanted to be there for that. I haven't gotten this dressed up twice in a 7 day period in a long, long time so I thought I would put up a picture of what "dressed up" looks like for me. After the service we congratulated our friends on their speeches, and then headed into town to pick up a few things before heading "home". I continued watching March Madness, but around 6 pm with the Bruins firmly in control of their game, we headed in for dinner....our last Sunday dinner with our friends on this trip.....Wednesday we begin our trek north and east. The weather is beginning to warm up with temps approaching the high 80's each day......time to begin moving northward.....as our good friends Chris and Cherie often say....."when the temperatures begin to get too hot move northward.....when they begin to get too cold move southward". It's a simple concept too which I subscribe to wholeheartedly! 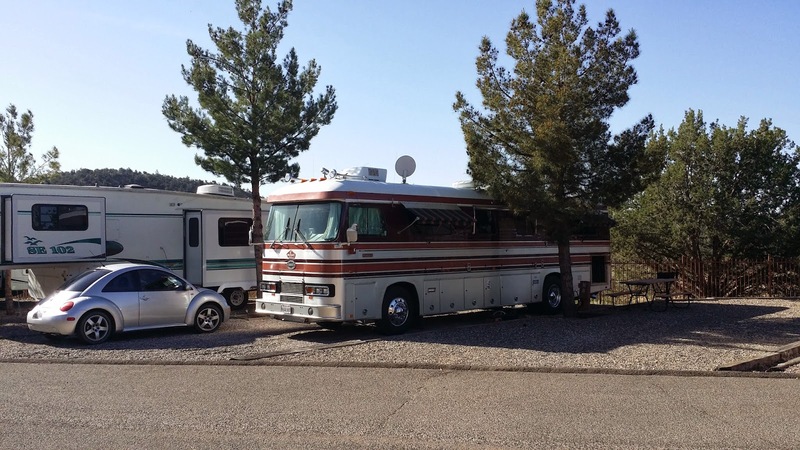 Ultimately we will do some site seeing around Jerome and Sedona, as well as some "boondocking", then head northward toward Page, AZ where we will explore a little of the Grand Canyon, Antelope Canyon, etc. Then eastward through New Mexico into Oklahoma where we will visit the Newell Factory, and then some friends in the local area. Eventually we will pass through Kansas City on our way to Sioux Falls, SD where we will turn west and head for South Lake Tahoe at a leisurely pace. That's the general plan subject to, of course, any deviations Mr. Jello, or Miss Serendipity may "suggest" along the way. Our only firm commitment is to be in South Lake Tahoe by May 17th.....7 weeks away. I woke up Saturday knowing it was Saturday......the real Saturday. I was anxious to re-deploy the patio awning to see how our repairs had done, but it is a two person job.....so I waited patiently for her loveliness to emerge from the bedroom......around 10 am, having given TLE an appropriate amount of time to wake up, sip a cup of coffee and peruse her Facebook page, TLE and I went outside to deploy the awning......and just as we hoped the repairs have held! The awning looks great, and the repaired tears are not even evident anymore. Every Saturday in what passes for "downtown" Wittmann there is a flea market that attracts a lot of vendors and patrons. We had browsed through some of the stalls two weeks ago, but it was at the end of the day that Saturday and many vendors had already packed up and left. I would say 75% of the items for sale are/were used tools, so if you are a guy there was a lot to look at. There were a few tools I almost pulled the trigger on, but in the end I had to admit to myself that I already have plenty of tools. TLE managed to find a couple of folks selling jewelry. We arrived back "home" around 11 am and I settled in to watching more NCAA March Madness basketball....at some points during the day there were 3 games in progress at the same time....pure heaven. There were a few upsets once again, but no overtimes. Sunday will be the continuation of the round of 32, and then no games again until Thursday, when it starts again. The last game ended just before 9:30 pm. Once in a while you just need a lazy day doing nothing.......thanks for stopping by! Friday dawned clear and cool.......did I say I love Arizona in the winter? The weather since we arrived going on three weeks ago has just been wonderful. We still have not run our air conditioning, and have only run our front electric heater a handful of times first thing in the morning for 10-15 minutes to take the chill off the interior. The big job for the day, which involved both TLE and I, was to repair two tears in our awning on each end where the fabric attaches to the aluminum "head casing". We had to immobilize the roller to take tension off the fabric, so I used a couple of "C" clamps to accomplish that. Before I go on I called ZipDee, the manufacturer of our awning, a few years ago (at least 4) about this problem and they told me how to fix it and sent me, free of charge, several pieces of the Sunbrella fabric to use in the repair. This is how long I have needed to fix this problem. In the interim the tears have slowly gotten worse, and it was time to fix them before they got too much bigger. At any rate, since the Sunbrella fabric is essentially silicone all I needed to do, according to ZipDee, was to use a silicone caulk to glue the fabric over the tear, clamp it, and let it dry, so that is what we did. The repair was actually easier than I expected, so now it is just a matter of letting it cure for 24 hours. After letting it cure all afternoon we stowed the awning away for the night, and will re-deploy it Saturday around noon having given the caulk 24 hours to cure. Friday was also the second day of the second round of March Madness. There have really been a number of close games, and 4, or 5 have gone to overtime. To give you an idea of how rare this is for March Madness, last year there were only two overtime games in the entire tournament. There were a couple more upsets of top seeded teams, but, fortunately for me UCLA was not one of them......they won their game against Tulsa State by 17 points. Later in the afternoon Tom and I drove over to Wells Country Store to buy dinner....for TLE and I another pizza, and for Tom 2 chili cheese hot dogs. Darlene was not going to be back from Mesa until after 8 so we sat outside once again watching the sun set, and eating our dinner. Off the beaten path.....way off!